From the beginning of time, except for the past few generations, humans lived their entire lives primarily in direct physical contact with the earth; therefore, it is assumed that humans throughout evolution were naturally grounded. In modern times, humans have insulated themselves from contact with the earth by wearing synthetic soled shoes and living in homes that elevate the body above the earth. Consequently, humans are no longer naturally grounded and now the body becomes charged with static electricity and radiated electric fields which thereby interferes with natural health and sleep. Many people notice that they feel better when they walk barefoot on the Earth. Recent research has explained why this happens. Our immune systems function optimally when our bodies have an adequate supply of electrons, which are easily and naturally obtained by barefoot contact with the Earth. Research indicates that electrons from the Earth have anti-oxidant effects that can protect the body from inflammation and its many well-documented health consequences. In situations where barefoot contact with the Earth is impractical, one can use various conductive systems that have been developed for the purpose of reconnecting people to the Earth; such as an Grounding sheet on a bed or an Grounding mat placed under the bare feet or wrists while using a computer. More than a decade of observation and research has shown that the more time people spend in conductive contact with the Earth, the better they feel. 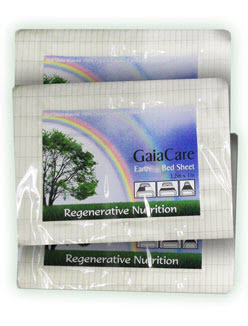 The Gaia Care Grounding bed sheet is electrically conductive. It is made from pure organic cotton with a pure silver conductive matrix incorporated throughout to enable an electrical connection to the earth/ground. The greater the amount of skin directly touching the sheet the better the effect in supplying free electrons and Schumann earth resonant frequencies to the body, and at the same time almost completely eliminating any EMF stress on the body while in contact with the sheet. The Sheet is used as an under sheet so the body lies directly on it. Any clothes worn while in bed will slightly reduce the effect but not eliminate the benefits. Just having feet and better still some bare legs in direct contact with it will significantly produce a good result. The sheet is 3.2m x 1m and can be used in several placements on the bed, as illustrated below. The Grounding sheet can lie right across of a double (even a king size) bed and then tuck under the mattress easily to give a 1m wide grounding area on the bottom half of bed, as illustrated in diagram A, or in the middle (not illustrated). If full body grounding is desired for a single person in a double bed, or if your partner does not want to be earthed then the placement illustrated in diagram B can be used (For full body grounding of both people simply add a second Gaia Care Grounding Bed Sheet). Full body grounding is achieved on a single bed as illustrated in diagram C.
Please see details of why you might need this by clicking the Directions/Materials tab above. The naked skin must be in contact with the Grounding bed sheet as far as possible. Avoid the use of creams and lotions on the body parts that will be in contact with the Grounding bed sheet, as this can reduce conductivity. Each Gaia Care Grounding Bed Sheet has a connector on it and is provided with an earth lead with an internal 100K ohm resistor. This means that even if the wrong socket connection is used there is no danger. It is important to have a good quality earth connection. This means that the third pin (The large upper most pin for UK sockets) has to have a wire connected to the Grounding bar of the main fuse box, (You cannot see this as it normally runs inside the walls) that is then in turn connected to a metal rod or plate buried in the ground. 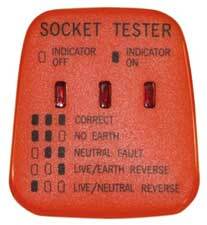 If you are unsure of the quality of the earth connection you will need to purchase an earth socket tester. These retail for around 3 to 4 GBP and are widely available from such online sources as eBay or from good quality electrical suppliers. A simple device such as that illustrated to the left. A good search term would be "UK mains socket tester"
We provide an optional UK type adaptor with this product, as a safety measure for homes with young children. When the earth pin socket of a UK electrical outlet is filled, then this opens the live and neutral sockets also, making it easy for children (or other risk groups) to insert something into the live socket, so causing death or injury. Please refer to the illustrations below. Fig.1 directly connected to a UK mains earth socket, Fig.2 connected to a UK mains earth socket via the optional adaptor. 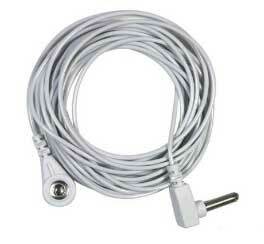 This adaptor will not open up live and neutral sockets and is recommended for households with young children. Disconnect the earth lead before washing. Wash gently with washing powder in an automatic washing machine or by hand, with no additives (fabric softener/bleach). Use your machines gentlest settings. *CAUTION: When running your own earth using copper wire to a rod in the ground, NEVER connect the wire directly to your Grounding bed sheet. Always connect to the earth lead provided, and connect THAT to the bed sheet by means of the button style contact provided. The 100K ohm internal resistor is fitted in the female button contact, by omitting the earthing lead you will be omitting a safety feature of the device. We now know why it has been an ancient practice of some cultures such as the American Indians to sometimes bury a sick person up to their neck in the ground and leave them there for hours or even days. It is now well established in practice by thousands of individuals and even scientifically proven by double blind trials that if a person is electrically in contact with the ground the healing response is increased. Sometimes health conditions can even resolve themselves, and usually symptoms significantly lessen. Benefits are noted in, but not limited to, arthritis, autoimmune disorders and many other common chronic health disorders. Furthermore the greater the area of the body that is in electrical contact with the ground and the greater the amount of time a person is electrically grounded over the 24 hour period the better the results. There are various degrees of electrical grounding of people. Before the introduction of rubber and plastic soles to most shoes, some degree of electrical conductivity (especially in damp conditions) was provided by leather soles. Before that (and as still practiced in some areas of hot countries) people go barefoot; this is the most natural method of grounding the body. Furthermore, in simple cultures both past and present, the body is in varying degrees of electrical contact with the earth when sleeping, on a mat made of natural material or on leaves or even to some extent on a concrete floor. The earth is a carrier of free electrons and also multiple Schumann resonance frequencies derived from worldwide lightning strikes. Both of these types of electrical activity are beneficial for helping to maintain the health of the animals and humans that are in contact with mother earth. Our separation from electrical contact with the earth is responsible for a significant aspect of our poor health, low energy and development of diseases. In fact, so significant, that I believe in a future saner world, it will be considered quite crazy and reckless for our health to sleep ungrounded. The supply of free electrons to the body. This has multiple effects, such as anti-oxidant, anti-inflammatory, raising the core electrical energy of the body in a healthy way to promote all biological functions including ATP synthesis i.e. the production of most of the bodies energy in every cell via cellular respiration. The almost complete elimination for electro-magnetic stress while we are earthed i.e electrically connected to the ground. Example any mains frequency or radio wave frequency including mobile phone transmitters that are impacting the body will be over 95% conducted away from the body and returned to earth. So with the virtual elimination of electromagnetic stress and simultaneously providing the body with free electrons and Schumann resonance frequencies for healing when we sleep at night it is not really surprising that the discovery of grounding has been called one of the greatest health discoveries. Any therapeutic regime that omits grounding is lacking a vital aspect.